I’ve been serving papers for 14 years. I recently had my first traverse hearing. I thought I’d share with you my experience. Here’s the background to this case: I personally served the defendant a foreclosure action in March of 2009. He did not answer the complaint. His property was sold back to the Plaintiff at public auction in September 2010. The Plaintiff evicted the defendant in 2013. At some point in 2014, the defendant moved back into the vacant house without the Plaintiff’s permission or knowledge. He continued to live there until 2016 when the Plaintiff discovered that the defendant had moved back in. So the Plaintiff started a new eviction proceeding. The defendant was re-served eviction papers. Defendant then petitioned the Supreme Court for a traverse hearing, claiming he was never served for foreclosure and the judge granted him a traverse hearing. The defendant’s attorney asked me if I brought my logbook to court. Because I had done my homework before the hearing, I knew this was a common practice at traverse hearings in NYC. Cases in NYC sometimes get dismissed if the server doesn’t bring his logbook to the hearing. It appeared the defendant’s attorney was trying to hold me to the New York City standard found in Article 8a section 89 CC of the General Business Law. So I explained that the logbook requirement did not apply to me, that it applied specifically to New York City process servers only. I then pointed him to Article 8 section 89u, which applies to servers outside of New York City. He then argued that I was still required to keep a logbook according to Article 8 section 89u. I then mentioned to him that an appeals court had ruled on this issue of logbooks just a couple of years ago in other case. In that case, the appeals court explicitly stated that a logbook is not required in Article 8 section 89u. At that very moment the Plaintiff’s attorney pulled out a copy of that decision and handed it to the defendant's attorney. The defendant’s attorney asked the judge for a couple of minutes in order to read the appeals court decision. After reading it, he tried to save face but ultimately moved on to a different topic. He then asked me if I brought the work ticket or any notes from this service, which occurred over eight years ago. I told him I did not. Once again I was able to point him to article 8 section 89u, which only requires process servers to keep records of their services for two years from the date of service. Again the attorney read that section and dropped that line of questioning. Then he asked me for my driver’s license. He compared my signature on the driver’s license to my signature on the affidavit. Of course, after signing tens of thousands of affidavits, my signature had transformed into a scribble faintly resembling a cursive “J” and wasn’t as legible as my signature on my driver’s license. After bringing attention to these differing signatures, the attorney actually suggested that I was not signing my own affidavits. He suggested that I was mailing unsigned affidavits to my clients and that they were fraudulently signing and notarizing my affidavits for me. Then the judge spoke up and mentioned that in fact his own signature as a judge used to be legible in his early days on the bench but now after many years of signing court documents, his own signature had become a less defined scribble as well. Next the defense attorney presented a printout of my LinkedIn page. He noted that I list my coverage area as Otsego, Delaware, and Schoharie Counties. He then suggested that since I don’t advertise Chenango County as a covered county, that just proves that I didn’t serve the defendant (since the defendant’s house is in Chenango County). My answer to him was that my coverage area has fluctuated over time. I also pointed out that the defendant's house, while in Chenango County, is very close to the Otsego County line. One thing that frustrated the defendant’s attorney was the fact that I did not have any recollection whatsoever of this service. Despite this, he repeatedly asked me questions about that day and I repeatedly told him I had no recollection of the service whatsoever. I believe he was trying to get me to recollect something - anything! - so that I could appear inconsistent. He even complained that he was struggling to find questions to ask me because all his questions involved getting me to recall the service. As for the defendant himself, a few months ago I became aware of a video that he had uploaded to YouTube to try to raise funds to retain his attorney. In that video, he made some statements that indicated that he indeed had been aware of this foreclosure action since 2009 (which contradicted his Affidavit to the court in which he claimed to have no knowledge that he was in foreclosure). I made a copy of the video and gave it to the plaintiff’s attorney. I did this because I feared the defendant would remove the video from YouTube once he realized the video could hurt his credibility. He did indeed remove the video only a few days after I made a copy of it. In court, it appeared the defendant was not aware that the plaintiff’s attorney had a copy of that video. So when the plaintiff’s attorney asked the defendant about comments made on that YouTube video, the defendant firmly denied making any such comments. The trap was set. The Plaintiff’s attorney then played the video. This was a pivotal moment in the hearing. The defendant was clearly caught off guard. Once the defendant saw the video in court, he changed his testimony to match the video. He tried to explain away his discrepancies but the damage was done. Finally, while the Plaintiff’s attorney was there to do the “heavy lifting” (and he did an excellent job! ), I felt a personal obligation to be fully prepared for this hearing and to do my part. I brushed up on the laws that govern our profession. I spoke to other process servers who had been through traverse hearings and they gave me helpful advice. And, of course, I got advice from some of my clients who are attorneys. The best advice I got over and over was simply….tell the truth, answer the question, and say no more. This is exactly what I did. This process has also pressed upon me my need to document everything. I now take more GPS stamped photos. I take more notes. I’m more observant. And I do my best to be super accurate on the affidavits of service. When closing arguments were completed, the judge immediately gave his bench decision declaring that I was credible and that the defendant wasn't. Yes, thankfully, my service was upheld. And I learned a lot of lessons in the process. The state of New York has made inflicting injury on process servers to prevent them from doing their jobs is a crime. A bill signed by Gov. Andrew Cuomo adds to second-degree assault provisions of state Penal Law 120.05 section (14), the crime of inflicting injury on process servers “with intent to prevent or obstruct” the performance of their duties. The measure (A6672/S2991) also stipulates that it should be considered assault by a person who seeks to prevent a process server from doing his job by “Releasing or failing to control an animal” such as a dog. Second-degree assault is a Class D felony in New York punishable by up to seven years in prison. 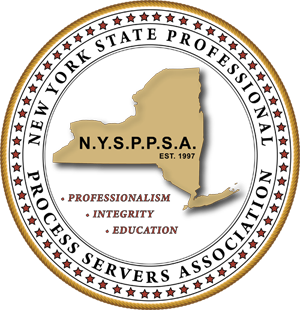 In a letter to Cuomo in June, the head of the state Professional Process Association, Larry Yellon, said the level of “hostility and aggression” toward process servers has increased in recent years and sometimes escalated past verbal abuse to physical violence. Yellon said process servers are an integral part of the judicial system by providing a direct link between parties and the courts. “They don’t deserve to be brutalized for simply doing their jobs,” he wrote Cuomo. Yellon said previously to the enactment of the new statute, those injuring process servers could only be charged with misdemeanors.